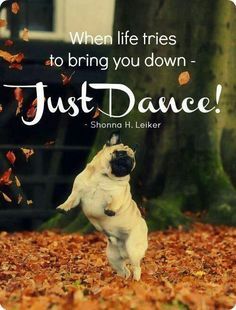 If you ask me, it is a given that no matter who you are, or what emotion you are feeling at the time, getting up and dancing will instantly make you feel happier and better about yourself. I obviously don’t remember this, but my mom constantly talks about how I used to sit in the dance studio with her as she waited for my sister to end class and watch my sister and her teammates dance on the TV in the studios lobby. My mom says I would immediately become the happiest little girl at only the age of two and that’s when she knew she had to sign me up to take dance classes and follow in my sister’s footsteps. I may claim that I instantly become happy when I dance merely because I have been a competitive dancer for sixteen years but I believe scientists would agree with me too.If you read here, it mentions how not only dancing by yourself but dancing with others could definitely make you feel happier and better about yourself. Reading this, talks about how the research on how dance makes one feel happier is mainly based off on the emotional aspects of an individual. What has danced helped with? Breast Cancer: here mentions a study that was done in Greece on women who had breast cancer and were proved to be happier and fortunately, felt less of their symptoms that they originally had felt after they participated in dance therapy. Parkinson’s Disease: this talks about a study that was done where individuals who suffered from Parkinson’s Disease participated in a ten week program where they danced; allowing them to not only emotionally feel better but to also increase their moods and tiredness. When feeling upset, the dance studio was always the place I would go to, to help cheer me up and lighten my mood. If you check out this you will learn more about how dance really is such an up lifter. It talks about how the main reason we get so happy when we dance has to do with the idea of us exercising which releases endorphins- the thing that basically makes us excited and happy. It’s possible that I am a little biased when it comes to saying dancing makes people happy, but after reading about this research and reading how it helped these individuals it became far more convincing that it wasn’t just me who felt this way. Dancing is such a fun thing. It’s cool because even if you aren’t good at it you can still have a good time doing it. At my house when I’m just walking around I will bust out a move and my mom loves it. It brings a huge smile to her face and she calls it random dancing by Owen Hawk. It’s cool that there is some science behind this. The blog was a blast to read and the use of bullets was a good touch. When I was really young, my parents forced me into doing dance classes. As a young boy, I thought dance was very effeminate and was actually embarrassed to go to class. So for young-me, dance was something I was forced to do that I had no interest in. Now I dance occasionally at parties and what not, but I never got to experience dance as a way to lighten the mood. Reading about dance being used to increase the joy in those who are sick is really neat though! I used to dance for about 13 years and I loved expressing my feelings through movement. I can really relate to your feelings towards dance as well. For me its not even professionally dancing at a studio but dancing at concerts or parties really heightens my mood as well!! I also think dance is very helpful for your mood. Im not one to dance often but when you just let loose its the most freeing feeling. With the ability to relieve stress I can see the added benefits.